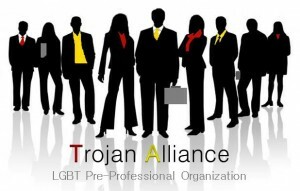 Trojan Alliance is a pre-professional association aimed at bringing networking resources to LGBT students at the University of Southern California. Trojan Alliance’s goal is to host job fairs with LGBT supportive companies, host discussions where Fortune 500 employees discuss coming out experience in the work place, resume building activities, mixers with different companies for all different majors, and many more events. If you are interested in becoming a part of Trojan Alliance email Trojan.Alliance@gmail.com or visit our Facebook.